Hello and welcome to Jobaffairs4u, for last couple of months NIOS deled 2 year course have become choice of lakhs of In-service Untrained Teachers across country to pursue and acquire the necessary training for becoming a trained teacher. As the admission process has been over and Identity Cards(DOWNLOAD ICARD) have been issued on NIOS DELED portal for all successful registered candidates. Now the confusion regarding various issues like STUDY MATERIAL,IDENTITY CARD, ABOUT CLASSES and other technical problems like Double Fee deduction during admission process are being in news and can be find on various portals where people are commenting their problem faced with getting no answers at all. So if you are also facing any one of the problems please read this post share with your friends. Lot of candidates were not able to register themselves successfully within due time of admission or those who got registered need further information for their doubt clearance. Here I am listing some major problems and queries which may have strike to your mind. 1. Wrong data submitted and needs correction. 2. Unable to verify their admission by principal . 3. Unable to download Identity card. 4. Double fees deducted during payment process. 5. Confusion regarding Study material. 6. Where to go for classes? 7. How to access digital Learning material of NIOS DELED? 9. What is Bridge Course for B.ED degree holders? 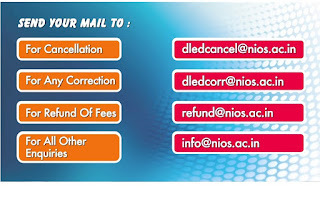 WHERE TO CONTACT FOR NIOS DETAILS CORRECTION, ADMISSION CANCELLATION AND FEE REFUND(DOUBLE PAYMENT)? There is no need get panic or being misguided by anyone. NIOS Chairman has released their Welcome message and Information describing about various procedures and steps to be followed for Acquiring Study material , Admission cancellation, Data correction and fee refund in case of double deduction. if you have entered your school UDISE code wrong by mistake you can correct it by logging in teacher registration section with your login email/mobile number and password and then click on update UDISE code by entering new UDISE code. In short no printed study material is coming to you from NIOS, So don't wait for it. NIOS has provided the updated study material on it's official website which is in PDF format for download and print friendly. Each registered candidate can access and download all the study material which is provided in various Indian Languages. NO COURIER, NO VPP, NO POSTAL. Dont buy any book which might be available in market in the name of NIOS, As told by NIOS Chairman in his video message All such books are fake and outdated. NIOS books available on-line are updated as per curriculum so every candidate is requested to download study material from official website only.No need to pay money other than admission and examination fees. WHERE TO GO FOR CLASSES? WHAT IS SWAYAM PLATFORM? At present you don't have to go anywhere , As Digital Learning methods are provided by NIOS on SWAYAM Platform. SWAYAM IS NAME OF THE WEBSITE PORTAL FOR DIGITAL LEARNING THROUGH VIDEO LECTURES AND OTHER MEANS PROVIDE THERE ON SITE. SWAYAM is a programme initiated by Government of India to provide 100 percent digital literacy through High Quality Content in form Audio and Video Lectures, On-line Discussions, Print materials.Courses delivered through SWAYAM are available free of cost to the learners, however students wanting certifications shall be registered, shall be offered a certificate on successful completion of the course, with a little fee. At the end of each course, there will be an assessment of the student through proctored examination and the marks/grades secured in this exam could be transferred to the academic record of the students. HOW TO GET REGISTERED ON SWAYAM PLATFORM? The very first way is to register by yourself by visiting the Swayam website on your laptop or desktop, providing your details about course and other information that appears on portal completely free of cost. The second way is through CSC Common Service Centers, NIOS has directed all the CSC's accross states for registration of NIOS DELED candidates.No charge will be taken from candidates. STEP 1st IS TO REGISTER ON SWAYAM WEBSITE. STEP 2nd IS TO ENROLL FOR DELED COURSE PROVIDED THERE. Complete detail and step-by-step guide is given in the link below. This guide is provided by NIOS itself. WHAT IS NIOS DELED APP ON GOOGLE PLAYSTORE? the teachers in accessing the study materials anywhere anytime for consumption of the course as per the timeline. Yes its available in different languages. WHAT IS BRIDGE COURSE FOR B.ED TEACHERS? NIOS is taking admission in its 6 month Diploma in Elementary Education (D.El.Ed) programme(Bridge course).Those Teachers who are teaching in schools and having graduation with B.ED degree and wants to teach in primary section 1st to 5th classes, for such teachers NIOS is inviting applications for its 6 months bridge course. So this Guide ends here, If you face any other issue or have any specific doubt relating to NIOS DELED Admission please feel free to ask in comment box. IF you find this information useful kindly share it to your friends.